Dimensions 0.75 by 4.25 by 6.75 in. Seconds before Earth is demolished to make way for a galactic freeway, Arthur Dent is plucked off the planet by his friend Ford Prefect, a researcher for the revised edition ofÂ The Hitchhikerâs Guide to the GalaxyÂ who, for the last fifteen years, has been posing as an out-of-work actor. Together, this dynamic pair began a journey through space aided by a galaxyful of fellow travelers: Zaphod Beeblebroxâthe two-headed, three-armed ex-hippie and totally out-to-lunch president of the galaxy; Trillian (formerly Tricia McMillan), Zaphodâs girlfriend, whom Arthur tried to pick up at a cocktail party once upon a time zone; Marvin, a paranoid, brilliant, and chronically depressed robot; and Veet Voojagig, a former graduate student obsessed with the disappearance of all the ballpoint pens heâs bought over the years. 25 col anv edition from Crown Pub (October 1, 2004); titled "The Hitchhiker's Guide to the Galaxy"
About: Chronicles the journeys, notions, and acquaintances of reluctant galactic traveler Arthur Dent, accompanied by never-before-published material from the late author's archives as well as commentary by famous fans. 25 anv edition from Crown Pub (August 1, 2004); titled "The Hitchhiker's Guide to the Galaxy"
About: Chronicles the journeys, notions, and acquaintances of reluctant galactic traveler Arthur Dent. from Harmony Books (September 1, 1989); titled "The Hitchhiker's Guide to the Galaxy"
New edition from Pan Macmillan (April 1, 2005); titled "The Hitchhiker's Guide to the Galaxy"
About: One Thursday lunchtime, the Earth gets unexpectedly demolished to make way for a new hyperspace bypass. New edition from Pan Macmillan (March 8, 2002); titled "The Hitchhiker's Guide to the Galaxy"
About: One Thursday lunchtime the Earth gets unexpectedly demolished to make way for a new hyperspace bypass. Reissue edition from Del Rey (June 1, 1997); titled "The Hitchhiker's Guide to the Galaxy"
Reissue edition from Del Rey (November 1, 1995); titled "The Hitchhiker's Guide to the Galaxy"
Reissue edition from Pocket Books (May 1, 1988); titled "Hitchhiker's Guide to the Galaxy"
from Del Rey (December 18, 2007); titled "The Hitchhiker's Guide to the Galaxy"
from Pan Macmillan (September 7, 2007); titled "The Hitchhiker's Guide to the Galaxy"
About: On Thursday lunchtime the Earth gets unexpectedly demolished to make way for a new hyperspace bypass. With Stephen Fry (other contributor) | Unabridged edition from Random House (April 19, 2005); titled "The Hitchhiker's Guide To The Galaxy"
About: Chronicles the off-beat and occasionally extraterrestrial journeys, notions, and acquaintances of galactic traveler Arthur Dent. 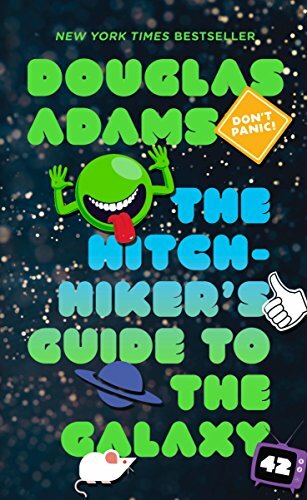 Mti edition from Pan Macmillan (April 1, 2005); titled "The Hitchhiker's Guide to the Galaxy"
About: Summer 2005 finally sees the release of The Hitchhiker's Guide To The Galaxy movie from Disney Touchstone Pictures. Unabridged edition from New Millenium Audio (May 1, 2002); titled "The Hitchhiker's Guide to the Galaxy"
from Dove Entertainment Inc (September 1, 1993); titled "Hitchhikers Guide to the Galaxy"
About: The Hitchhiker's Guide to the Galaxy is a comic science fiction series created by Douglas Adams. from Pan Macmillan (April 1, 2005); titled "The Hitchhiker's Guide to the Galaxy"
About: Losing your planet isn't the end of the world. Abridged edition from Dove Entertainment Inc (December 1, 1990); titled "The Hitchhikers Guide to the Galaxy"
About: Don't leave earth without this story of the end of the world and the happy-go-lucky days that follow. Abridged edition from Simon & Schuster (October 1, 1986); titled "The Hitchhiker's Guide to the Galaxy"
About: Based closely on the original BBC broadcast, this is a dazzling dramatic production that chronicles the cosmically comic misadventure of Earth's sole survivor. from Dh Audio (May 1, 1985); titled "The Hitchhiker's Guide to the Galaxy"
About: Summer 2005 finally sees the release of “The Hitchhiker’s Guide to the Galaxy movie from Touchstone Pictures”. Reprint edition from Demco Media (June 1, 1997); titled "The Hitchhiker's Guide to the Galaxy"
Reprint edition from Paw Prints (June 26, 2008); titled "The Hitchhiker's Guide to the Galaxy"
from Turtleback Books (October 1, 1999); titled "The Hitchhiker's Guide to the Galaxy"
from Turtleback Books (September 27, 1995); titled "Hitchhiker's Guide to the Galaxy"